A place where the products of my mindless imagination come alive. Or not. I was going slightly crazy the past few days and was about to hit the panic button to anyone willing to listen. Then I realised it was no longer appropriate to feel any more invested than I already am. Letting go is making sure you keep moving forward. Frankly, I have no answer to that. I don’t think it’s my ego or my self-esteem that is holding on to whatever that is no longer there. I’ve been through the five stages of grief and I am no longer as angry and devastated as I was two years ago. Maybe I am finally moving on to the acceptance stage. Yes, I have been willing to move on and accept that change is going to happen. But then sometimes memories would flood back without warning and I’d get choked up. And I’d regress and have to start the moving-on process all over again. Because it’s incredibly hard to let go of someone who you think is the other half that fits you completely. So it’s been really tough, because there are times when I have this genuine fear come rushing all over me like a cold chill and that I would discover new pain to hurt myself with. It’s a constant effort to keep telling myself it’s ok and to forcibly block myself from seeing or reading things that might affect me. Which also explains why I have not logged on to Facebook or other social media sites for prolonged period. Maybe I am terrified to face the unknown, because I was so certain that you are the one for me and I kept hoping beyond hope that you will finally realise it one day. How silly of me, right? It shouldn’t matter if you’re happier or doing better than me or that you’ve moved on and found someone new. We are two different people after all. I can’t stop you from forgetting what we have shared and been through. I can only stop wasting so much energy thinking about you and devote more time to healing my wounds. I can’t hold on to you or my feelings for you any more. 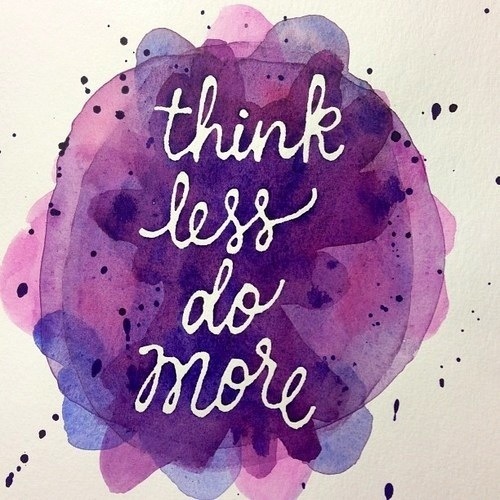 So yes, I have to think less and do more. Very apt, don’t you think? We met for a reason. You were either a blessing or a lesson.